1 Gauge is considered by many model railroaders to be the “King” of gauges. Many collectors say when you hold a 1-Gauge locomotive in your hand every other scale seems insignificant. 1 gauge, Gauge 1 or Gauge One as it is know is a model railroading and toy train standard, popular in the early 20th century, particularly with European manufacturers. Its track measures 1.75 in (44.45 mm), making it larger than 0 gauge but slightly smaller than wide gauge, which came to be the dominant U.S. standard during the 1920s. Over the last 40 years Marklin was one of the key manufactures of 1 Gauge models and just recently KM1, Kiss and a bunch of other smaller producers are making HUGH contributions to the gauge. Today with digital electronics sound functions, steam, lighting and more everything is possible adding a whole new dimension to the gauge. 1 Gauge offers particularly realistic operations thanks to authentic details, materials, and effects. 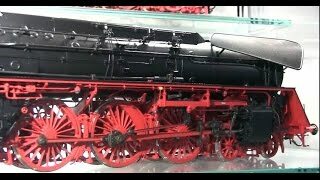 The excellent workmanship and the impressive appearance in 1:32 Scale will thrill big and small locomotive engineers alike.